Waiting on Wednesday is a weekly feature of the Breaking the Spine blog. It's a great way to share information about forthcoming books with other readers. 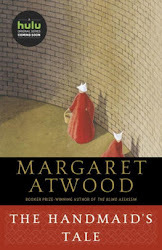 Today I'm featuring The Heart Goes Last, the new novel from author Margaret Atwood. Frombarnesandnoble.com: Living in their car, surviving on tips, Charmaine and Stan are in a desperate state. So, when they see an advertisement for Consilience, a 'social experiment' offering stable jobs and a home of their own, they sign up immediately. All they have to do in return for suburban paradise is give up their freedom every second month – swapping their home for a prison cell. At first, all is well. But then, unknown to each other, Stan and Charmaine develop passionate obsessions with their 'Alternates,' the couple that occupy their house when they are in prison. Soon the pressures of conformity, mistrust, guilt and sexual desire begin to take over.